In the central corridor of Calit2's Nano3 clean room facility: (l-r) Nano3's Fruhberger; grad student Bondarenko; and ECE assistant project scientist Maziar Nezhad, first author on the Nature Photonics paper. (PhysOrg.com) -- Imagine packing 4 billion nanolasers on a three-inch semiconductor wafer. That is now nearer to reality, thanks to researchers at the University of California, San Diego’s Jacobs School of Engineering, who have demonstrated a micron-sized laser - less than one-thousandth of a millimeter on each side - that can operate at room temperature. Until now, the only way to operate such a nanolaser was to cool it cryogenically to offset the various losses in the device. The UCSD solution, as published online in advance of appearing in the May issue of the journal Nature Photonics, was to add super-thin layers of silica (glass) and aluminum to encase the core of each device. To achieve a subwavelength laser, Nezhad and his colleagues in Fainman’s Ultrafast and Nanoscale Optics Group worked through a series of approaches to create an efficient subwavelength cavity. The conventional approach used in the past for this purpose had been to use a fully dielectric cavity, but it quickly became evident that in the subwavelength size regime this type of cavity would not lead to a working solution. The UCSD team decided to incorporate a metal/dielectric composite layer in the nanolaser design to create an efficient resonant cavity and also to electromagnetically isolate the nanolaser from surrounding devices. The immediate candidates for the metal to be used - aluminum, gold and silver - all have good optical properties because they are very reflective (i.e., they absorb less light). In the tests described in the Nature Photonics article, aluminum was used, but Nezhad says that in theory, silver should be the most efficient shield. The fabrication was done in the Nano3 clean room facility of the California Institute for Telecommunications and Information Technology (Calit2) at UC San Diego. To create and characterize the tiny lasers with their composite layers of glass and aluminum, the team made extensive use of Nano3’s electron beam lithography, etchers, deposition tools, scanning electron microsocopy and optical profiling equipment. Once the wafers of micron-sized laser cavities were complete, optical measurements were performed in Fainman’s lab in the Jacobs School of Engineering. ECE grad student Olesya Bondarenko inspects the chamber of the AJA sputter deposition tool in a Nano3 clean room in Atkinson Hall. While other NACHOS-funded teams were mainly working on solutions at cryogenic temperatures, UC San Diego focused on delivering an optically-pumped laser operating in pulse mode at room temperature - which it delivered last summer. 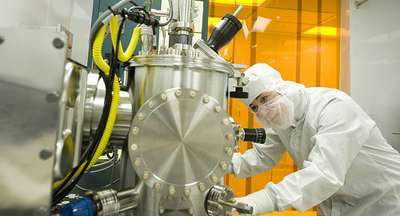 In the ongoing Phase Two of the project, the research teams are working on replacing the optical pump with electrical pumping (also known as injection pumping) and by the end of the five-year program’s final phase in 2012, the research teams are expected to demonstrate nanolasers operating in continuous rather than pulsed mode. Meanwhile, the teams at other universities are working on their own solutions to the challenges set forth by DARPA, so the researchers at UC San Diego won’t be resting on their laurels.